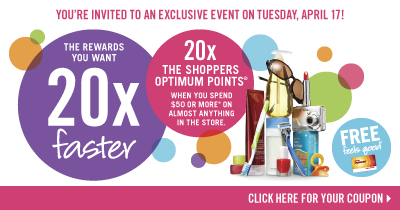 Am off to Shoppers Drug Mart today for their bonus 20x the Shoppers Optimum points event! Planning to pick up milk, toilet paper, Lady Speed Stick antiperspirant, Depends for my Grandma, Mission Impossible 4 Bluray, and some other odds and ends. Actually have quite a few things to pick up, so the hubby is coming to help--I'm sure he's amused! Just love my points, that's all! 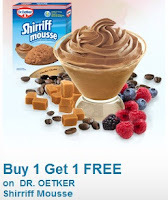 With the BOGO free coupon from Websaver, or with the $0.50 off coupons found on tearpads in store, you can get Dr. Oetker Shirriff Mousse at Sobeys for $0.50. Not a bad deal! Assorted varieties available. Picked up a stash, as they are good to have on hand for a quick sweet treat! Off to take Liam to school, then drag the hubby to Shoppers Drug Mart! Happy clipping and saving y'all!